Three Ways to Learn: DVD * Book * Internet. Composed by Alex Nolan and Tim Quick. Guitar Method or Supplement; Method/Instruction. Rock. Book; DVD. National Guitar Workshop Publications #07-1117. Published by National Guitar Workshop Publications (AP.7-1117). 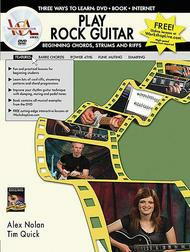 This beginning level DVD/book package is designed for aspiring rock guitarists. You'll learn the proper picking technique for downstrokes and alternate picking, rhythmic strumming patterns using a mix of quarter, eighth and sixteenth notes, and the open chords, barre chords and power chords that are the heart of rock rhythm guitar. It also explains how to combine movable chords into chord progressions in any key, how to mix chords and open string pedal tones, how to use chord hits and stabs to create exciting riffs, damping and muting for a tight, punchy sound, and much more!